China and Japan have re-started high-level talks on maritime issues, the Chinese Foreign Ministry announced in a press release on Wednesday. The talks took place in the Chinese port city of Qingdao on September 23 and 24. This week’s talks were led by Yi Xianliang, the deputy director-general of the Chinese Foreign Ministry’s Department of Boundary and Ocean Affairs and Makita Shimokawa, deputy director-general of the Japanese Foreign Ministry’s Asian and Oceanian Affairs Bureau. The talks also involved officials from China and Japan’s defense ministries, foreign ministries, maritime affairs bureaus, and energy bureaus. The first round of these high-level maritime talks took place in May 2012; that also marked the last such discussion until this week’s meeting in Qingdao. China-Japan relations took a sharp nosedive toward the end of 2012 when the Japanese government purchased several of the disputed Senkaku/Diaoyu Islands from a private owner. Tokyo insisted it had done so only to prevent a more inflammatory alternative — nationalist Tokyo Mayor Shintaro Ishihara had promised to buy the islands and begin construction on them. Beijing did not accept this explanation and accused Japan of escalating the territorial dispute by nationalizing the islands. Fall 2012 marked the beginning of sharply increased Chinese patrols, both by sea and by air, near the disputed islands. China-Japan relations deteriorated even further under Prime Minister Shinzo Abe. His December 2013 visit to the Yasukuni Shrine, where Japanese war dead are enshrined, enraged Beijing. Since then, China has called for Japan to show sincere remorse for World War II atrocities. Abe’s moves to loosen restrictions on Japan’s Self Defense Forces have also caused concern in China that Tokyo is returning to a militaristic path. Meanwhile, Tokyo denounced China’s declaration of an Air Defense Identification Zone over the East China Sea in November 2013 and argues that increased Chinese aggression makes it necessary for Japan to up its defense readiness. Given these tensions, it’s a highly positive sign that China and Japan has at least resumed discussions on one of the major points of tension: maritime affairs. According to the press release, China and Japan exchanged views on East China Sea issues (presumably including the disputed Senkaku/Diaoyu Islands) and maritime cooperation. Both sides agreed in principle to hold another round of talks at the end of this year or early in 2015. The two sides also agreed to resume liaisons between their two defense ministries on maritime issues . This last point would be a major step forward; the lack of any hotline or standard communication mechanisms on maritime issues is of major concern to those who fear an accident or misstep by China or Japan could spark a full-on conflict. The resumption of maritime consultations is just the latest in a string of positive steps in China-Japan relations. Earlier this week, the largest-ever Japanese business delegation traveled to China. The delegation met with Vice Premier Wang Yang and Commerce Minister Gao Hucheng to discuss ways of promoting the China-Japan economic relationship. Gao was particularly concerned about a 43 percent drop in Japanese foreign direct investment in China in the first eight months of 2014 compared to 2013. Signs are also encouraging on the military front. The heads of the Chinese and Japanese navy met informally twice this year, once in April at the Western Pacific Naval Symposium and again at the International Seapower Symposium held in mid-September at the U.S. Naval War College. Meanwhile, the number of government-affiliated Chinese vessels sent to patrol the disputed region has dropped sharply since 2012 (although the number of Chinese fishing vessels in the area has increased). With this week’s talks and the promise of future mil-to-mil communication on maritime issues, China-Japan military relations are at their highest level since 2012. All this positive momentum may be leading up to a first-ever meeting between Chinese President Xi Jinping and Shinzo Abe at this November’s APEC Summit. Abe will attend the summit, which will be held in Beijing, but it’s still uncertain that Xi will agree to a bilateral meeting with his Japanese counterpart. Abe has not fulfilled the Chinese conditions for such a meeting, namely a promise not to visit Yasukuni again and an expression of remorse for Japan’s wartime actions. Regardless of whether the summit takes place, a resumption of talks about maritime issues is important in and of itself. The fact that China and Japan have restarted discussions about one of the most damaging issues in the bilateral relationship is encouraging. An agreement this week will lead to the implementation of a long-sought hotline. 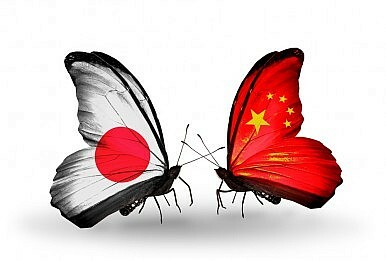 China Plays It Coy on Xi-Abe MeetingThree Things for Xi Jinping and Shinzo Abe to ReadChina's 'Victory Day' Celebration Will Xi and Abe Meet at APEC in Beijing?East China Sea: What Do China and Japan Really Want?